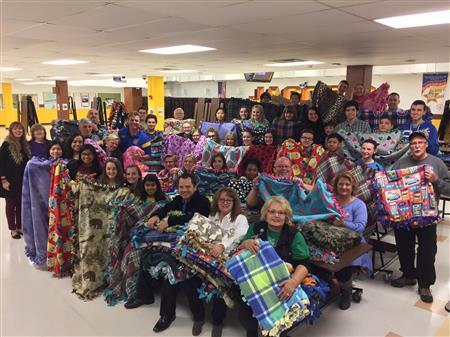 On April 4th the Lake in the Hills Rotary Club will combine forces with the Jacobs Interact Club to make blankets for Phil's Friends. We will not hold our regular meeting at noon. 2018 Rotary Scholarships are now available! The Rotary Club of Lake in the Hills is offering up to 6 Scholarships listed below for students to help prepare them for the future and fuel their passion toward a specific career. Candidates must demonstrate their passion for involvement through community activities, employment and/or school activities. Tom Stock Memorial Scholarship: This is a $3,000 Scholarship which will be awarded to one high school senior who is a member in good standing with the Rotary Interact and demonstrates academic excellence as well as a commitment to community service. Service Above Self Scholarship: This is a $2,000 Scholarship which will be awarded to one high school senior who successfully demonstrates academic excellence as well as a commitment to community service. 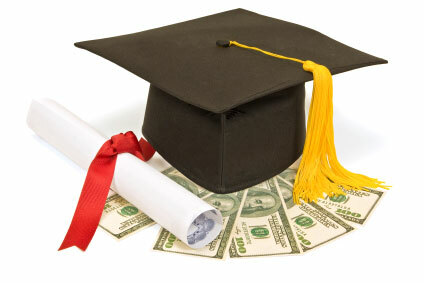 Making a Difference Community Scholarship: These are $1,500 scholarships which will be awarded to four high school seniors who, through their community involvement through work or school, have made a difference in our community. Under forms download the Scholarship Requirements as well as the Scholarship Application and return them to us by March 31st! On Sunday November 19th we will be distributing the food families will need to prepare meals for Thanksgiving. In preparation to distribute food to close to 200 families we will need a lot of help. Here are the times we need help with. Friday: 5:00 PM - 7:00 PM or a little later. Unload more food and assemble packages for distribution. Assist with folks that are picking up food or deliver food to the folks that can't make it to us. On Sunday November 19th the Rotary Club of Lake in the Hills will hand out and deliver Thanksgiving baskets to families in need. The baskets will contain the typical items a family would need to host a nice Thanksgiving meal. If you are in need or you are aware of someone that could use a little additional help as we enter the holiday season please pass this information along. The sign up form for the baskets is under forms on the left side of this page. The regular meeting of the club for October 4 will be cancelled as the entire club will be participating in a Visioning Session that week! The Visioning Session will be an active 3 1/2 - 4 hour workshop involving all club members. The outcome of session will help create a plan to achieve the vision as to what the club would like to accomplish over the next three years both locally and around the world. During the session, led by four facilitators from Rotary District 6440, the members will discuss the Club’s future in areas such as community service, vocational service, international service and the efforts of creating a stronger Club organization. Rotary is an organization of business and professional leaders united worldwide who provide humanitarian service, and help to build goodwill and peace in the world. There are approximately 1.2 million Rotarians who are members of more than 30,000 Rotary clubs in 169 countries. 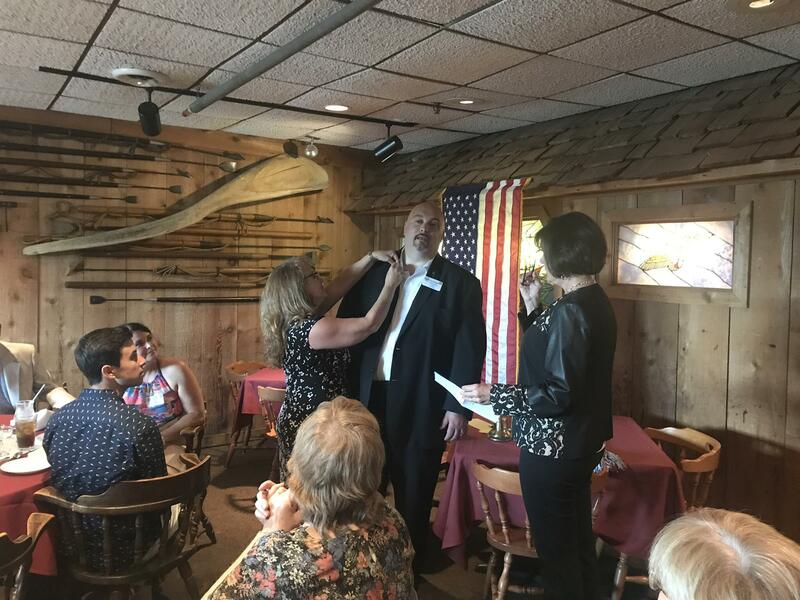 On Sunday, June 25, 2017, our Club held the 2017/2018 Installation dinner. Our incoming President Jim Benages and the Board of Officers and Directors were installled for the 2017/2018 Rotary year. Representing the District leadership was our very own Assistant Governor Mary Bishop and District Governor Nominee, Julie Clark, who conducted the installation. It also was an opportunity for members to hear what is being planned by our new president for the upcoming year! Good luck Jim! 2016 Lake in the Hills Rotary Rockin' RibFest proceeds fund numerous local organizations and projects. 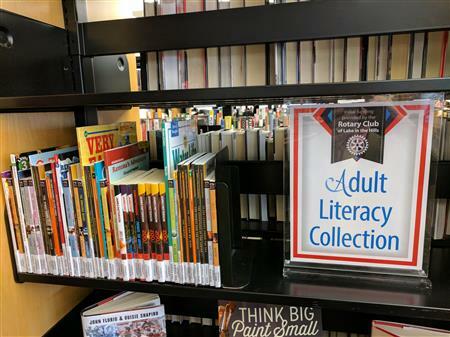 During the months of April and May 2017, not-for-profit organizations all over McHenry county were given the opportunity to submit grant proposals for a share of $19,000 in grant awards. 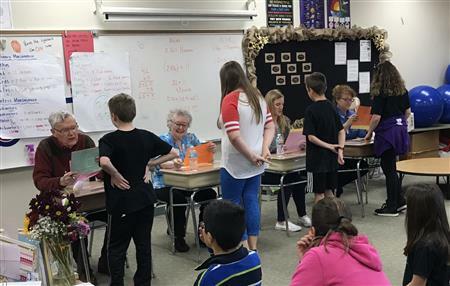 Last year, we donated money to a local school for a program called "Battle of the Books" so that books could be purchased for 4th and 5th graders. They split up into teams, had an opportunity to read 30 different books and then 'compete' on what they remembered from what they read. Today was one of those competitions. We had the pleasure of moderating several of the rounds. It was so much fun to share in the kids' excitement and amazing how much recall they had from the stories they read! Please share with any high school seniors you know who may be eligible to benefit! Tom Stock Memorial Scholarship: This $3,000 scholarship will be awarded to one high school senior who is a Rotary Interact member, demonstrates academic excellence, a significant commitment to community service and is involved in extra-curricular activities. Service Above Self Scholarship: This $2,000 scholarship will be awarded to one high school senior who successfully demonstrates academic excellence and a significant commitment to service. Making a Difference Community Scholarship: This $1,500 scholarship will be awarded to four high school seniors who successfully made a difference in our community. Completed applications are due April 29, 2017. Calling all Not-For-Profits (NFPs)! Here's a wonderful opportunity to apply for a grant for that special project you've been trying to get done but just can't get into your budget. The Rotary Club of Lake in the Hills is awarding 9 grants to local NFPs in three different categories. Deadline for application is May 12th, 2017. All criteria and applications can be found at www.lithrotary.org. Know an NFP that could qualify? Tell them to check this out but don't wait. We are all "Phil's Friends"
The Club met on 12-14-16 at Jacobs High School. It was a very special event as club members had the opportunity to tour the in-school food pantry that the club partnered with District 300 to start. The club provided initial funding of $5,000 to help initiate the project and has committed to supporting the project on a long term basis. The project, called "On Eagles Wings", enables students to bring home supplemental food supplies as well as other supplies. After the tour, the club members delivered Holiday food baskets to students (and their families) participating in the food pantry. This has been quite a week for our club members! As is required by our bylaws, the election of Officers and Directors took place at our first meeting in December, which was December 7, 2017. Elected Officers for the 2017-2018 term were the following: Jim Benages as President, Bill Dustin as President- Elect, Jim Wales as Secretary, Yvonne Cornett as Treasurer. Elected Directors to the Board were Steve Swanson, Colleen Wales, Ron Magrini and Jack Bechaud. Dot Dustin, the current President will serve as Immediate Past President. These positions are effective July 1, 2017. Another item on the agenda for this week was the annual ringing the bells for the Salvation Army. Every year our club selects a date to go out to help this non-profit raise funds to help the needy. Invariably, it almost always turns out to be one of the coldest days and this year was no exception. Braving the cold this year, a great number of club member showed up to help ring the bells! It may have been freezing but the warmth brought on by the comaraderie between members helps the club achieve this objective every year! The last major item addressed by the club this week was the authorization of sending emergency relief funds in the amount of $1,000 to the Rotary Club of Gatlinburg Tennessee. That area has been devastated by wildfires with loss of life, injuries and a substantial number homes damaged or destroyed and the Rotary Club for Gatlinburg has initiated efforts to help wherever they can. 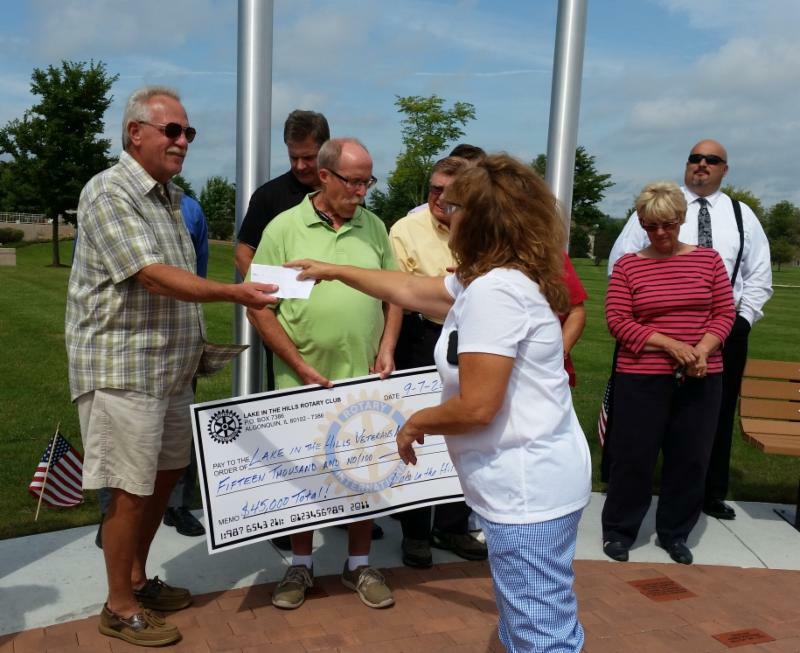 In May 2014, the Lake in the Hills Rotary Club announced that they would be donating $45,000, toward the construction of the Veterans Memorial located at the Lake in the Hills Village Hall. After many hours of making blankets by our Rotarians and Jacobs HS Interactors at today's meeting representatives from Phil's Friends were present where they gave a presentation on their organization and they were given over 70 blankets. The blankets are part of a Care Package that Phil's Friends provides to cancer patients around the country. 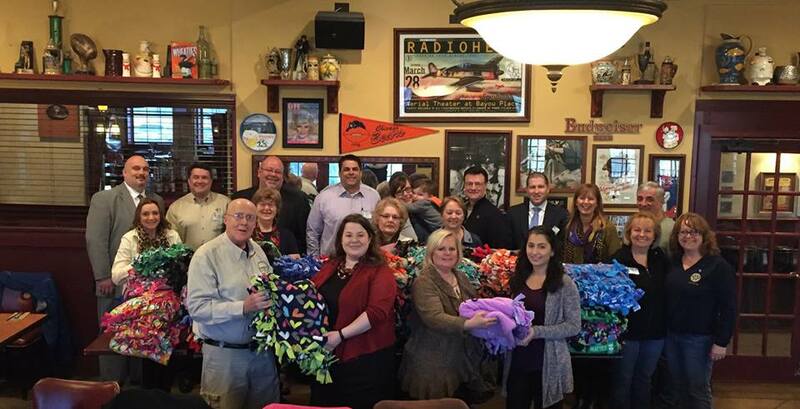 On Tuesday, February 16, 2016, the Rotary Club of Lake in the Hills joined forces with the Jacobs High School Interact Club to make 77 blankets. The blankets are going to be donated to Phil's Friends, an organization that assists cancer patients, including providing care packages as they are undergoing treatment. Great teamwork project for a great cause! Once every quarter, instead of our regular meeting at Morettie's (our regular meeting location at 220 N. Randall Rd. ), the Club tries to have a working meeting at the Algonquin/Lake in the Hills Food Pantry. On October 28, 2015, Club members spent the time cleaning bins to be used for food donations as well as cleaning counters and floors. Additionally the members helped stock the shelves! On January 28, 2015, Phil Zielke, a 2 time cancer survivor and creator of Phil’s Friends, gave a presentation to the Rotary Club of Lake in the Hills on the objectives of his organization. After a difficult and painful treatment for Stage 4 Hodgkin’s Lymphoma, Phil’s Friends was created. The goal was to reach out to cancer patients to help them in 3 ways – deliver CARE packages, Cards of Hope and emotional support and guidance. After the presentation, the club decided to take on a project with Phil’s Friends to help them in their support of cancer patients. The Club purchased fabric material so that blankets, an item that goes into every CARE package, could be made. The Jacobs High School Interact Club, under the direction of their advisor, Kim Barone, then began the process of starting the assembling process for the blankets. On Thursday, March 5, 2015, several Club members completed the assembly process, ultimately arriving at 57 blankets to be donated to Phil’s Friends. On Saturday, March 7, 2015, a number of representatives from the Rotary Club of Lake in the Hills went to the national headquarters for Phil’s Friends, located in Roselle, Illinois. There, in addition to delivering the blankets, they volunteered and worked that morning at the headquarters, putting together CARE packages for delivery to hospitals, stenciling the CARE package boxes and completing Cards of Hopes which go to each of the cancer patients. On February 23, six representatives of the Rotary Club of Lake in the Hills returned from Guatemala, after being part of Rotary District 6440 Service projects team in Guatemala. The group departed on February 14, 2015, with 4 different objectives for their service trip, taking place in and around Sumpango Guatemala. The first objective was transforming what had been a outside water fountain into a 2 story building to be used as a computer lab and library. The second objective was fixing up a building to be used as a health center in a small village outside of Sumpango. The 3rd objective was conducting educationally based activities with children in a local school. The 4th and final objective was the distribution of 50 water filtration kits to families for the provision of clean water. 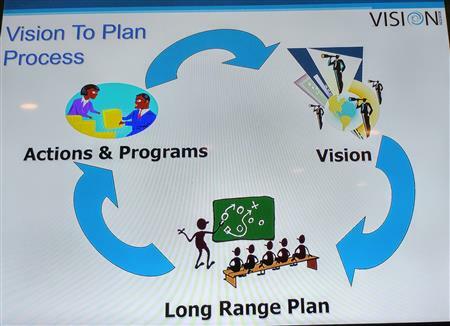 The major components of all 4 objectives were complicated in the ten days the team was in Guatemala. The team returned on February 23, 2015, which happens to be the 110th Anniversary of Rotary International, a service organization dedicated to providing public service to local and international communities. 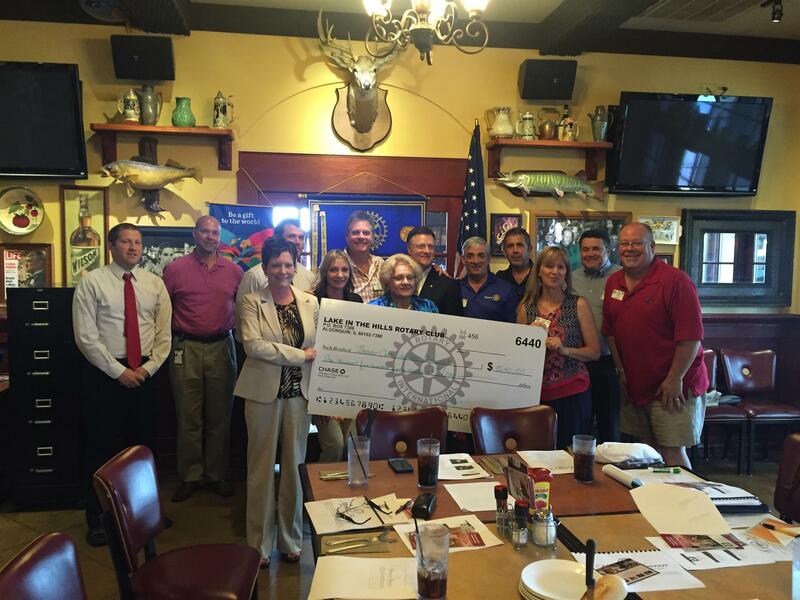 The Lake in the Hills Rotary Club has had a busy summer! Recently, Club members awarded $12,000 in scholarships to the following students: “Service Above Self” Scholarship Recipients were Blake Jacobs and Sai Sivakumar. “Make a Difference “Community” Scholarship Recipients were Abigail Nordeen, Emma Nickoley, Alyssa Reinke and Andrew Frey. We wish all of these young adults success in their endeavors. During last month’s Community Mobile Food Pantry, over 150 families were served. This event was sponsored by the Lake in the Hills Rotary Club. Their next scheduled Community Mobile Food Pantry will be on Friday, August 8, 2014 at 600 Harvest Gate in Lake in the Hills from 4:00 p.m. to 6:00 p.m. Anyone is welcome to attend. The Lake in the Hills Rotary Club has committed $45,000 over three years to help with the construction of the Lake in the Hills Veterans Memorial project. The first installment of $15,000 was presented during this week’s Lake in the Hills Village Board meeting. Presently, the village has $61,000 collected toward the project, said Village Trustee Russ Ruzanski. Trustee Ruzanski said the village is hoping to start work on the memorial at Village Hall between Labor Day and Veterans Day of this year. A formal groundbreaking ceremony is scheduled for Veterans' Day. The memorial will include a brick walking path around the Village Hall and a curved wall, with five granite pieces representing different branches of military service. To contribute to the Village of Lake in the Hills Veterans Memorial Fund account, visit the Castle Bank locations in the village at 2100 W. Algonquin Road or 4520 W. Algonquin Road. The Rotary Club of Lake in the Hills came together during the first quarter to envision what the club would like to accomplish in the next three years both locally and around the world. During a four hour session with three facilitators, the members discussed the Club’s future in areas such as community service, vocational service (high ethical standards), international service and the efforts of creating a stronger Club organization. It is through the fundraising efforts of the Rotary Ribfest and other programs that the Lake in the Hills Rotary Club is able to provide support locally and internationally to a variety of organizations. The Lake in the Hills Rotary Club is a volunteer organization of business and professional leaders who provide humanitarian service and build goodwill. Club meets weekly on Wednesday, Noon to 1:00 p.m. at Moretti’s Ristorante in Lake in the Hills. To learn more about the Rotary Club of Lake in the Hills, visit www.lith.org .